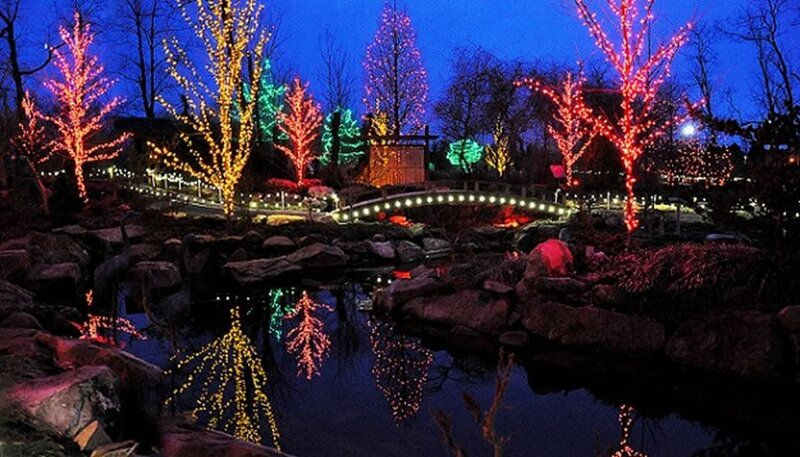 The Creation Museum has announced expanded dates for its highly anticipated annual free Christmas celebration known as ChristmasTown—running daily December 16–23 and 26–30 this year. In addition to the beautiful light displays (tens of thousands total) decorating the scenic gardens, returning features include a live Nativity, an outdoor drama highlighting the story of the Magi, and other biblical characters throughout the gardens. Attracting up to 30,000 people each season who drive an average of 132 miles one way, ChristmasTown seems to grow in size each year. Visitors can enjoy the outdoor light displays without paying museum admission, with activities getting underway each evening as it begins to get dark, around 5:00 p.m.
With a live Nativity as the event’s focus on the museum’s beautifully decorated grounds, ChristmasTown presents the true meaning of Christmas as it provides families a glimpse into the amazing events surrounding the wonder of Christ’s birth. The museum’s acclaimed planetarium will present its special ticketed program, The Christmas Star, about the mysterious star in the east that heralded the birth of Jesus and guided the wise men to Him. ChristmasTown guests will have the opportunity to experience the popular zip line over the museum’s beautiful three-acre lake, and soar over what many guests say is the most spectacular Christmas light show in the area. (There is a $29 charge for the zip line.) The petting zoo will also be open where guests can visit members of the donkey kind—such as Mary may have ridden to Bethlehem—and for a small fee, they can ride camels similar to what the wise men may have ridden in their search for the newborn King. The Creation Museum is located in Petersburg, Kentucky, at exit 11 off I-275, only two exits west of the Cincinnati Airport. Previous visitors have indicated that it’s the most dazzling show of Christmas lights in the entire region. Inside the museum, Noah’s Café will serve a tasty turkey dinner (only $6.99), and will also offer an assortment of other festive food and drinks for sale. The bookstore will similarly carry an additional array of Christmas items for purchase. We love offering ChristmasTown as a free, fun experience for families during the holidays. As we offer this free gift to the community, we reflect on the greatest gift ever given: the free gift of salvation through Jesus Christ, who was the Babe in the manger. It is important to us that we keep this the focus of our message in the midst of all the holiday festivities. ChristmasTown is open 5–8 p.m. ET. All the outdoor activities (except for the camel rides and zip line) are free, and the indoor concerts are free as well. Each family visiting will receive a free Christmas booklet. More information about all of the special Christmas events, plus details on purchasing tickets for the zip line, planetarium programs, and discounted Creation Museum admission during ChristmasTown, can be found at CreationMuseum.org/christmas or by calling (888) 582-4253. The Creation Museum is an outreach of the apologetics organization of Answers in Genesis (AiG), which opened a full-size Noah’s Ark last July on 800 acres in Williamstown, Kentucky (40 miles from the museum). The Ark Encounter, which has drawn about 450,000 visitors in four months, will also be decorated for Christmas with the grounds beautifully lit on December 16–23 and 26–30 (the same days as ChristmasTown at the museum) and will stay open until 9 p.m. Normal entrance fees apply. For information on AiG and its multiple outreaches, visit AnswersInGenesis.org.